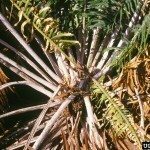 how can I keep my sago palms from getting so big? I have the sagos in a bed in the front lawn. I'd like them to stay the size they are now. What can I do? There's nothing you can do to make a plant stop growing, unless you kill it. Sagos are not like common branching plants, that you can prune to a certain size. If you cut the trunk, or remove the growing tip, sometimes they send up pups from the base, or from the top of the trunk, but not reliably. If you already have pups coming up, you can cut out trunks as they get too big. You'll probably be happier with the result if you start off with plants that mature to the size you want, rather than starting off with a larger plant and then pruning it constantly to keep it small.